What do we do in January? Every 4 years in the US, we inaugurate a new president here in the USA. This guy, well, Trump is interesting. We are all holding our breath and hoping for the best. Many of my non-US sailing friends have pelted me with questions about the voting process, the impact of social media and “what’s next?” I live near Washington D.C. It’s tough to be associated with the disarray and follow-on discontent, and I tend to distance myself from the lunacy in the media and in some parts of the US government. The only good news is that they gave us the day off from work for the inaguration as the roads in D.C. were jammed with protestors. Staying off the roads was a good play. What else do we do in January? Well above the equator, the options to sail are a little limited and where we live the weather has been crazy, with wild temperatures upswings and a lot of non-skiable precipitation. Frankly, I would just rather have it be snowing as I like to ski. That has led to the bathroom renovation project being put in high gear and while it’s going well, the project snowballed and we ended up doing a lot more than we originally planned. 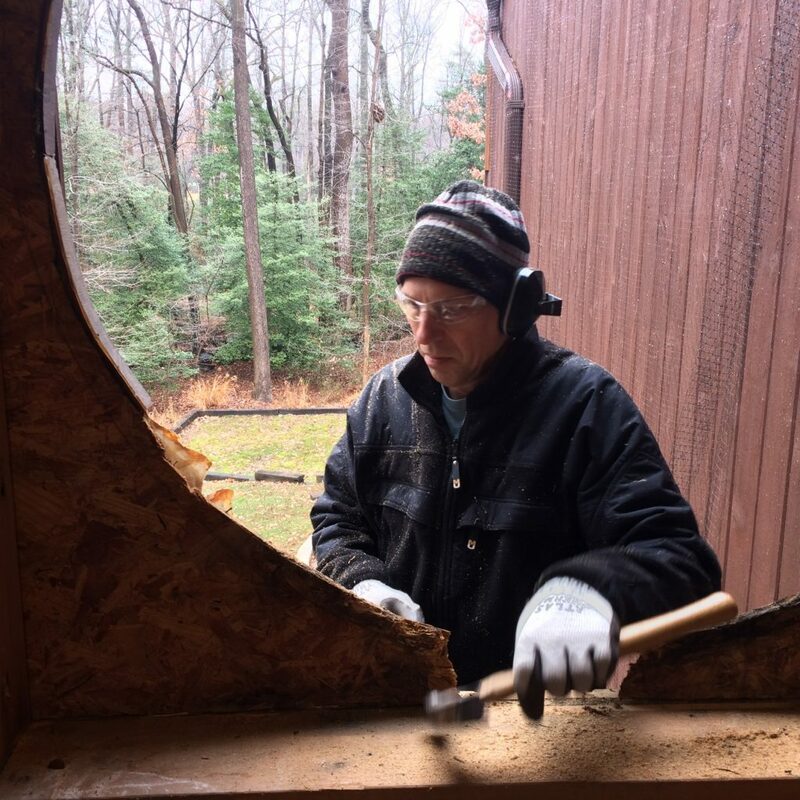 In this photo, I am cutting a hole in the side of the house on a cold day and installing a new window. I would also say that boat repair skills lend themselves to home improvement. Also, in January of most years, planning for the future gets serious. We are past the holiday celebrations and we are moving forward with our next two Hobie16 world Championships events. In these events the format will change slightly: note that we will be eliminating the on-site qualifying portion of the event. All sailors competing in the open, must pre-qualify from their home region. This change will simplify the event, reduce costs, and allow us to extend the open portion of the event offering more value to sailors. The path to the Hobie16 Worlds now requires participation in your home region, and so will stimulate participation in your regional regattas and regional championships. Growth and participation at the local level is something we will all benefit from. January is technically a wrap, so wish your US friends good luck with Mr. Trump, wish me luck with the bathroom, and look forward to the upcoming Worlds!